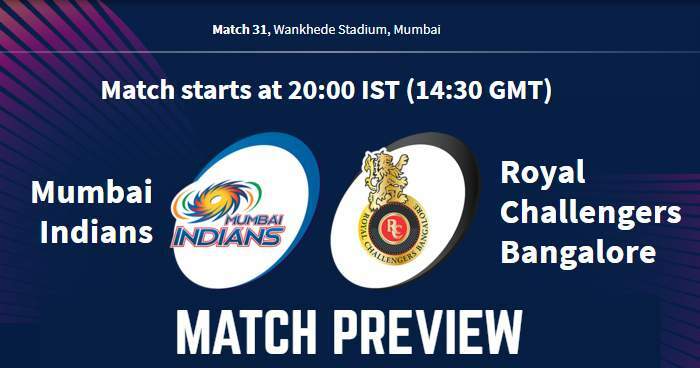 Mumbai Indians will take on Royal Challengers Bangalore in the 31st match of the 12th season of the Indian Premier League - IPL2019 on 15 April 2019 at Wankhede Stadium, Mumbai. As far as weather is concerned, it will be warm and humid match hours with a temperature around 30°C and humidity above 70%. It's been an absolute belter here this season. The pitch is so hard, lots of grass, it only adds to pace and bounce. Wankhede has a batting-friendly pitch. The ball will come on to the bat nicely, should be plenty of runs on this surface, a typical Wankhede pitch. Mumbai Indians are 4th on the points table with 8 points in 7 games; 4 wins and 3 loss. On the other hand Royal Challengers Bangalore are last on the points table with 2 points in 7 matches; 1 win and 6 loss. Mumbai Indians are forced to replace Alzarri Joseph who landed badly on his shoulder; Lasith Malinga will take his place. Probable Playing XI for MI: Rohit Sharma (c), Quinton de Kock (wk), Suryakumar Yadav, Kieron Pollard, Hardik Pandya, Ishan Kishan, Krunal Pandya, Lasith Malinga, Jasprit Bumrah, Rahul Chahar, Jason Behrendorff. Royal Challengers Bangalore have won their first game of the season and would not like to tinker their playing XI. Probable Playing XI for RCB: Virat Kohli (c), Parthiv Patel (wk), AB de Villiers, Marcus Stoinis, Moeen Ali, Akshdeep Nath, Pawan Negi, Yuzvendra Chahal, Umesh Yadav, Navdeep Saini, Mohammed Siraj. Mumbai Indians (MI) and Royal Challengers Bangalore (RCB) have played 24 matches against each other in Indian Premier League (IPL). Out of 24 matches in IPL, Mumbai Indians have won 15 matches whereas Royal Challengers Bangalore has won only 9 matches. 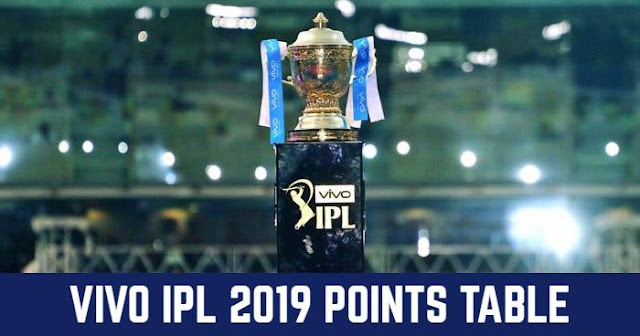 In the last match between Mumbai Indians and Royal Challengers Bangalore was played in IPL 2019 on 28 March 2019 where Mumbai Indians won by 6 runs. At Wankhede Stadium, Mumbai; Mumbai Indians have and Royal Challengers Bangalore have played 8 matches against each other and 5 are won by MI and 3 are won by Royal Challengers Bangalore. Since 2016, Mumbai Indians have won six of the seven head to head contests against RCB, including all three at the Wankhede. The average first innings total in the last 13 IPL matches at the Wankhede Stadium is 178. Pacers have taken 39 of the 48 wickets to have been picked up by bowlers in VIVO IPL 2019 matches at the Wankhede Stadium.